There's nothing tastier than a fresh, homemade, salsa on a hot summer day...well maybe add a cold beer to go with it. So when visiting Southern California recently, I was excited to try my friend's corn salsa recipe. Delicoius by itself, on chicken tacos or with carnitas! 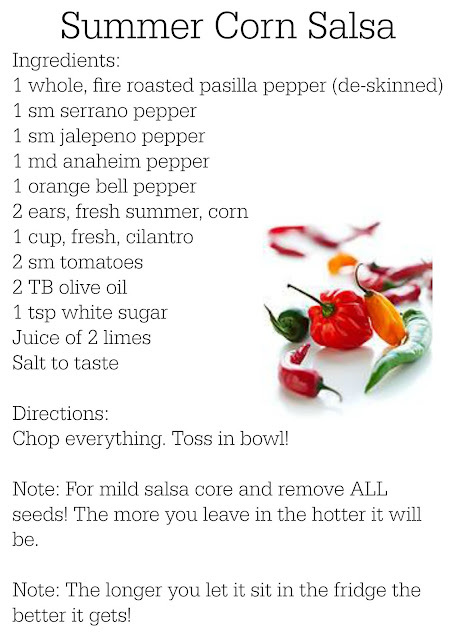 I've made some alterations to his original recipe (using fresh corn instead of canned and adding a tomato for a different level of acidity) I'm sharing with you my Summer Corn Salsa!